Water, the essence of life, is essential for the survival of all forms of life on the earth. More than two-third part i.e. 70% of earth's surface is covered by water. Among this, 96.5% of water is found in the form of oceans which is salty and not fit for drinking. The remaining 2.5% is fresh water, out of which majority of water i.e. 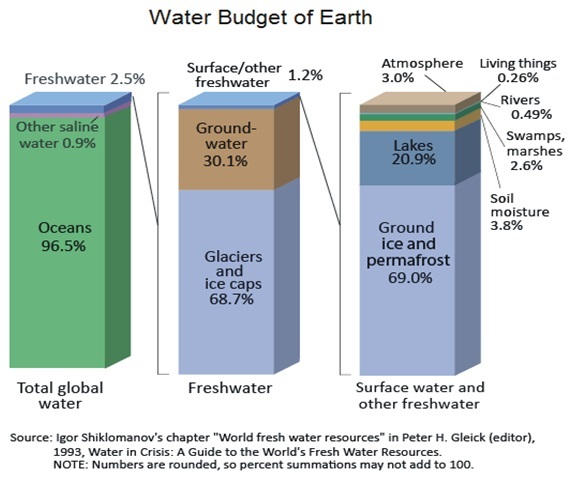 more than 68.7% is frozen in the form of glaciers or ice caps, 30.1% is ground water and nearly 1.2% is available as drinking water in the form of ground ice (permafrost), lakes, rivers, swamps, and soil moisture etc . Figure below shows the detailed distribution of total global water available into different forms and sectors. Its was studied that the major portion of the available water on the earth hardly participates in global water cycle, thus, remains preserved at their original place of existence. The only part of water used by the living beings is the cyclic water that undergoes different processes such as evaporation/transpiration, cloud formation, precipitation (snow/rain/drizzles/hails/dew/fog), soil infiltrations and ground water formation etc. Therefore, in conclusion, merely negligible portion of the total water on earth is accessible to the mankind and require very intelligent usage & least wastage. The present water supply service area of Municipal Corporations Chandigarh (MCC) is 114 km2, which includes MCC area 79.34 km2 and rural area of 34.69 km2. The urban area falls in jurisdiction of Municipal Corporation and the water supply system is entrusted to Public Health wing of MCC. The rural area comprises of 13 villages overseen by the Engineering Department. The water supply to the villages is provided with tube wells in and around the villages. Other urban/rural areas have water source of 67 MGD from Bhakra Main Canal which is 27 km away from Chandigarh and 20 MGD from 239 tube wells located in the city. The transmission mains carry raw water from Kajuali to the water treatment plants located at Sector 39. At sector 39, the water is treated, disinfected and transmitted to 7 No. subsidiary water works located in Sectors 12, 26, 32, 37, 52 and Manimajra. The average availability of water in Chandigarh is reasonably high at 332 Litres per Capita per Day (LPCD), stands second in the country after Goa (343 LPCD). 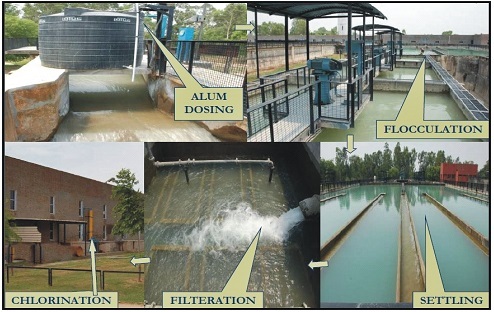 Chandigarh gets 14.5 million gallons per day (MGD) water as its share from each phase of Kajauli water supply scheme. Chandimandir cantonment and Haryana is in process of installing its infrastructure for treatment and transmission of water. The net available water will be only 78.0 MGD, if Haryana and Chandimandir Cantonment starts drawing their share of raw water from Chandigarh.